Gone are the days when a chandelier was only used to welcome guests into the grand foyer or to illuminate formal meals in the banquet-sized dining room. While chandeliers were once reserved for the wealthy, nowadays you can find all different types of chandeliers in every room in the home. With such a variety to choose from, it’s hard to know where to begin. A chandelier is almost always the focal point of a room, so it’s important to consider what kind of statement you want to make. Is it a formal space? 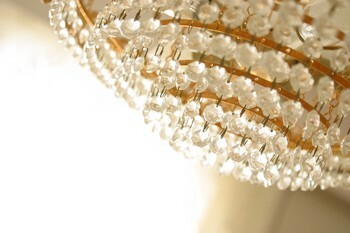 You might want to try a crystal chandelier. If you’re going for a more contemporary look, a wrought iron fixture might be more appropriate. Your home is a reflection of who you are, so make sure you pick something that you will be happy with in the long-run. The size is just as important as the color and style. If the fixture is too big, it will be overwhelming for the space, while a chandelier that is too small will make the room look bare and it will not catch your attention. Also, remember that a chandelier is more of a decoration than an effective light source, so it shouldn’t be the only source of light in the room. Consider layering the light in a space by starting with the chandelier and then adding accent lights.